Many companies are now using Design for Excellence (DfX)¹ methodology – most often in the redesign phase – for its proven effectiveness in increasing product value and reducing costs. 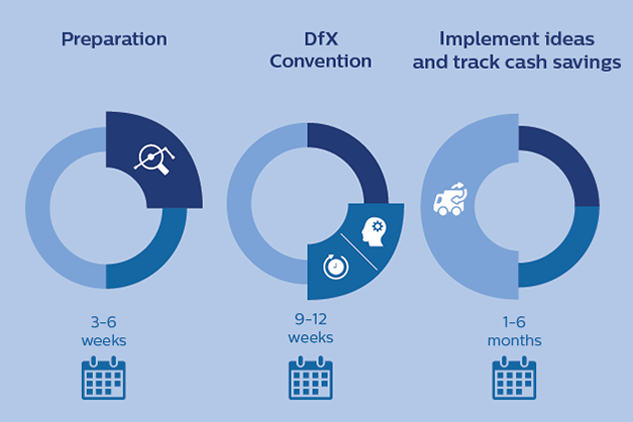 Philips Innovation Services is capable of successfully deploying a DfX convention across all areas of product life cycle – from first idea to the golden tail. 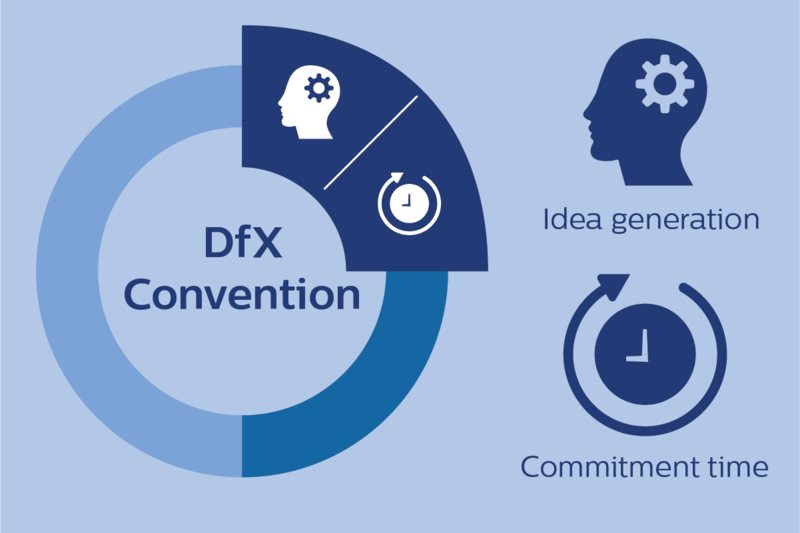 In a nutshell, DfX methodology focuses on considering each and every factor that can influence a product’s value or cost – from concept to delivery – and identifying the ‘golden’ combination that will deliver the very best results at the lowest possible investment. DfX obviously lends itself very well to product/portfolio redesign. Products are generally composed of building blocks. Smart analysis, redefining and rearranging of those blocks will invariably result in products that are both cheaper and more valuable. But DfX conventions can be applied – and deliver benefits – across a wider spectrum of development cycles and areas; from design and manufacturing, to market and innovation, and supply chain and supplier markets. For instance, most manufacturers aim to succeed in multiple market segments. Deploying DfX in the earliest concept and design phases can pave the way to creating the easiest and most ideal business situation: one where the product has maximum simplicity in design with as few building blocks as possible – but which can still be segmented without much difficulty. When you design, compromise is always necessary. The DfX approach ensures that optimal product architecture decisions are made from the very start. Philips Innovation Services has also used DfX methodology to assist a customer who wanted to launch a more expensive product type when there were still very successful low-cost versions in the market. By focusing on market and product differentiations through the DfX lens, we helped the customer combine previous platforms and fresh concepts to create a uniquely different platform that enabled penetration in new market segments. When customers have a price or margin problem that just needs urgent fixing – we have also been able to deliver highly effective solutions by deploying a DfX convention. And near the end of a product’s life cycle, DfX can even pinpoint strategies that will maximize end-of-life profitability to create a ‘golden tail’. No matter why or in which product life cycle phase we deploy a DfX convention, it is always an extremely multidisciplinary and collaborative exercise. Philips Innovation Services’ expertise is in coordinating and facilitating the DfX process. But the focus of the convention is on tapping into the insights – and stimulating the creative ideas – of people within the company who are involved in bringing the products or services to the market. Sometimes we are asked to provide know-how (such as expertise in sensors, heat exchange, etc.) that is not available in-house. And in the all-important ideation stages, we always try to bring in outside viewpoints from different knowledge domains. This stimulates out-of-box thinking. But it is primarily company employees – working within the pressure cooker of DfX methodology – who come up with the ideas that can make an incredible difference. What is the DfX process? The content of each DfX trajectory is unique, but the process is relatively standardized. There are four key stages. The first two can sometimes be somewhat combined, depending on the customer and their situation and wishes. An intensive, multi-day assessment in which 2-3 consultants collect customer input and insights. This lets us crystallize the customer’s request and create a clear overview of opportunity areas for adding value and cutting cost. Determining the scope/target of the DfX convention, deciding which of 40+ analytic tools could best be applied (i.e., tear-down, value-stream mapping, feature/value analysis, etc. ), and preparing the convention in detail. Tool application and intensive idea generation based on the analyzed results. The most promising ideas are clustered, ranked and tailored to finally pinpoint an ‘ultimate’ architectural solution that is supported by a sound business case. Convention results are summarized in a Decision Sheet, which describes the idea, its benefits, and the required investments and resources in detail. Keeping track and monitoring the results of all implemented and realized ideas, ensuring that savings are being delivered to the planned schedule. How much can I save with DfX? At the end of a Quick Scan, we are already able to give a well-founded estimate of the savings that can be achieved. For products that have been in the market for 2-4 years, this can sometimes be as much as 30-40%. A ballpark figure of 15-25% is very realistic. For ‘last man standing’ products more than 20 years old that have already been redesigned, it is still quite possible to still save 3-5%. In practice, the original Quick Scan estimates tend to be conservative: the results usually exceed expectations. How long does a DfX convention take? The length of a DfX convention is generally determined by the development cycle it takes place in. In early design stages, which include critical groundwork such as value proposition creation, it can last 6-12 months. For product redesign, up to four months is required. However, for products with very short life cycles, these timelines can be shorter.